Moniliformis cryptosaudi n. sp. 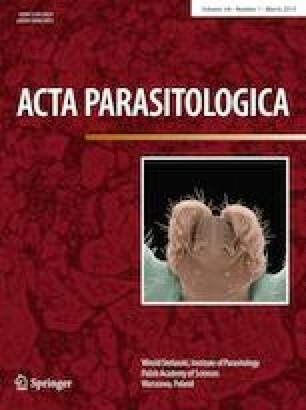 (Moniliformidae) is an acanthocephalan described from the long-eared hedgehog Hemiechinus auritus (Gmelin) (Erinaceidae) in Iraq as an incipient cryptic species of Moniliformis saudi Amin, Heckmann, Mohammed, Evans, 2016 described from the desert hedgehog Paraechinus aethiopicus (Ehrenberg) (Erinaceidae) in Saudi Arabia. Microscopical studies demonstrate that the two species are morphologically indistinguishable with practically identical measurements and counts but differed significantly in their energy dispersive X-ray analysis (EDXA) of metal composition of hooks. Hooks of specimens of the new species appeared to be of collagen material with very low levels of phosphorus and calcium unlike those of M. saudi and Moniliformis kalahariensis Meyer, 1931 that had high levels of calcium and phosphorus. Using 18S rDNA and cox1 genes, M. Saudi and M. kalahariensis were shown to be molecularly distinct but the molecular profiles of M. saudi and M. cryptosaudi were more similar. The molecular profile of M. kalahariensis collected from the South African hedgehog Atelerix frontalis Smith (Erinaceidae) in South Africa is reported for the first time and is studied only for comparative purposes. Moniliformis saudi and M. kalahariensis had comparable EDXA metal analysis that was distinct from that of M. cryptosaudi. This project was supported by the Department of Biology, Brigham Young University (BYU), Provo, Utah and by an Institutional Grant from the Parasitology Center, Inc. (PCI), Scottsdale, Arizona. We thank Sarah Vorkink Child, Bean Museum (BYU) for expert help in the preparation and organization of plates.